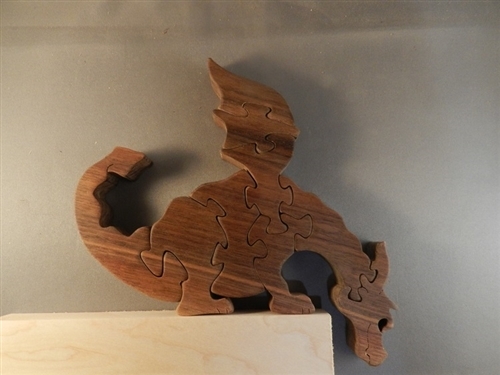 The Watchful Dragon is 6.5" high x 7" wide x 3/4" thick and made from walnut. It is best displayed on a surface where the dragon can look down. A bookcase or door frame works well. One of most popular dragons. Contains choke-able pieces and not suitable for children under 3 years of age. Copyright © 2016 Pickens Puzzles LLC. All Rights Reserved.